Leannahollis.com is a participant in the Amazon Services LLC Associates Program, an affiliate advertising program designed to provide a means for sites to earn advertising fees by advertising and linking to amazon.com. This blog post contains affiliate links, which means if you click on the link to make a purchase, I may make a small amount of money (usually a few cents) from your purchase. It will not increase the price you pay in any way. This post contains recommendations for products I have read in the past and for some I have not purchased or read but can recommend because of the consistent quality of the author's work. Several weeks ago, I gathered a list of favorite books from friends and co-workers. Many of my favs were on the list. I intended to do a blog about great reads, and I still will, but I was quickly sidetracked. Two paragraphs into the rough draft, I realized the Mitford series of books was so pivotal in my life, both as a reader and a writer, that it deserved a blog post of its own. 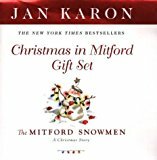 Jan Karon’s Mitford books are stories of Father Timothy Kavanagh, a confirmed bachelor and Episcopalian rector in the tiny town of Mitford, as well as the unlikely people who weave themselves into his life. The first book, At Home in Mitford, was copyrighted in 1994. More than twenty years later, these stories are as fresh and pertinent as ever. I reread the entire series almost every year and still laugh, cry, and sometimes cheer out loud for Father Tim and the people of Mitford. Like all good fiction, these characters come to life on the page. They struggle with the same issues that plague me. They work to overcome, aim to live higher, strive to be more like Christ. At least most of the time. The lessons they learn become my lessons, as well. These books hold life-changing words, not just for the people within, but for the reader, as well. They’ve helped deepen my walk with Christ. It was Father Tim who taught me the prayer that never fails and the four words that are most needed in any situation – especially in times of tribulation. I love these funny, true-to-life characters. They feel like family and the little town of Mitford is a lot like Blue Springs. The word pictures Jan Karon paints are vivid in my mind. Her writing shows me the value of stories of everyday life, as well as the struggles we face as we try to act like Jesus when it’s not as easy as we hoped. Jan Karon spoke at the National Cathedral in 2014. The woman who introduced her spoke of Jan’s “gentleness of spirit,” and said, “Jan’s voice and her stories remind us of the calm and steady, loving presence of God at work in our lives.” It was the gentleness in her writing that first drew me to the Mitford stories. The evidence of God at work in the lives of her characters kept me reading. I hope it will you, too. A happy surprise greeted me when I searched Amazon for a list of books. There are more Mitford books than I knew! Mitford is one of my happy places, so I’ve stepped back in with the new books. I think you’ll love these stories, too. The Mitford books also include a cookbook and collections of Father Tim’s favorite quotes, a collection of his sermons, Christmas books, and a series of children’s books, so keep reading to the end. I’ve included them all! This book began my love affair with Mitford. Father Timothy Kavanagh is a lifelong bachelor and Episcopalian rector. His simple existence is rocked by the arrival of a rescue dog “the size of a Buick” and a grubby, rowdy boy in need of love, as well as a surprising jewel thief and an attractive neighbor with great legs. It’s a wonderful, funny, poignant story. This book held many surprises for me. First, Father Tim is increasingly interested in his attractive neighbor who keeps popping through the hedge. He is surprised by the unwelcome attention of a wealthy widow. Cousin Meg unsettles his household and creates quite an uproar before her hasty departure. Suddenly, he has “woman trouble” at an age when he expected anything but. A Light in the Window is poignant, funny, and endearing. I cheered and cried and sometimes did both at the same time. Father Tim and Cynthia face considerable challenges as they settle into newlywed life with his massive dog, rectory renovations, and the adventures of life with Dooley. Their experience on a camping trip moved me on a deep level and caused me to address a few of my own deep-rooted issues. Every book is better than the last, and this is no exception. Struggles in Mitford remind me so much of the adventures and challenges in my own little town. Father Tim, of course, is in the midst of them all as he struggles to lead by example and offer wisdom in situations that are a little “murky.” I often wish I could be as wise as he. After Father Tim retired from his congregation at Mitford, he accepted a temporary post with a small island church. The idea of continuing to serve after you reach retirement age planted a seed that grew into fruition with full-time ministry. His struggles with letting go of former responsibilities resonated with me on a deep level. This book has always been one of my favorites. This is the story of Father Tim’s and Cynthia’s wedding. It’s a funny, poignant, and heart-warming tale as well as a reminder that it’s never too late for love. Cynthia, a famous children’s author and artist/illustrator, enjoys a flurry of fame while Father Tim languishes in retirement. The search for Dooley’s missing siblings leads him into the mountain community from which both Dooley and Lace Turner came. In a place of extreme poverty, he finds people with few material possessions but an abundance of caring, community, and common sense as well as a new and deeply satisfying place of ministry. I love the reminder of all the “least of these” can teach those of us who think we have the most. I haven’t read this one but hope to include it in my Christmas reading. It’s the story of Father Tim’s efforts to restore a vintage nativity scene as a surprise for Cynthia and focuses on the importance of giving from the heart. I haven’t read this book yet… It’s the story of Father Tim’s assignment to revive a church that’s been closed for decades. For the first time in decades, Father Tim visits his childhood home in small-town Mississippi and is forced to confront the painful memories of his past. In the process, he finds forgiveness, peace, and a deep understanding that, regardless of our skin color, we’re all very much alike. This is a deeply emotional book. I wept more than once but rejoiced at the unexpected blessing healing brings. Father Tim’s journey is an example for us all. Father Tim and Cynthia take a long vacation to Ireland, intending to explore his Irish roots. They find more than ancestry at the family-run fishing lodge where they stay. A stolen painting, a long-hidden diary, and a suffocating secret draw the two vacationers into the family’s pain. I’m no better at taking breaks or vacations than Father Tim, so I could identify with this story in many ways. It reminded me, once again, of the importance of surrendering my priorities in order to help those who are desperate to find redemption. I’m re-reading this book now. Father Tim and Cynthia have just returned to Mitford after a trip to Ireland. He’s grumpy and (spoiler alert) his housekeeper insists he take a dose of “purgative.” It reminded me so much of my mama when we were little girls that I laughed out loud. It was not good to be grumpy around Mama. She would get out the Fletcher’s Castoria. Just one more reason Mitford feels like home – because it’s just like home. This is another of the books I didn’t know about but am excited to read. It tells the story of the wedding of Dooley (Father Tim’s adopted son) and Lace Harper. It’s a low-budget affair and the entire community joins forces to pull it off. I long for a rainy day and a Mitford binge, don’t you? 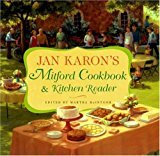 Jan Karon’s latest book was released in September 2017. I haven’t read it yet, but I will. Publisher’s information describes a devastating crisis facing Dooley and Lace, adventures involving three generations of Kavanaghs, and multiple adventures involving the citizens of Mitford. It’s not to be missed. This is a collection of Father Tim’s favorite quotes. In the days before Amazon, I read this book from the local library. It was so beautiful I began a quote journal of my own. Mine’s not as powerful as Father Tim’s though, and this is one of the print copies I purchased while writing this blog post. Like any good Southern town, Mitford’s citizens gather to eat, and they eat well. All the famous Mitford recipes are here, including Esther’s Orange Marmalade Cake, also referred to as the OMC. It’s the only cake I know that serves as both character and dessert. The link will take you to the main Amazon page for the book. Be sure to notice the hardcover is a good bit cheaper than the paperback. I scrolled through a bit and found a hardcover copy in pristine condition with like-new dust cover for $6.23 with free shipping. Of course, I hit the buy button as fast as I could. I plan to convert the OMC to gluten-free and serve it for our next holiday dessert. Since it put Father Tim in a diabetic coma twice, I might need to check potential eaters’ blood sugar before serving, though. This is a two-book hardcover gift set and was a “runaway bestseller” two years running. I haven’t seen this book yet, but it’s Mitford. This is another recent Mitford purchase. After I realized I could refine my options by changing the view on the left to “like-new” and “very good” only, it simplified the shopping process considerably. One seller has it listed for $628.82. Even with free shipping, it’s a bad deal, but you can find a good deal. I ordered it used and like new for less than $7.00 with free shipping. It’s not available on Kindle. This 32-page book is a sweet story about becoming what you were meant to be. I checked all sellers listed on Jan Karon’s website, but it’s either out of stock or temporarily unavailable everywhere except Amazon. You can find it used but it’s a little pricey. I’ve included the link to be complete. It’s not available for Kindle or Audible. Since I have neither read nor seen these books, I’m adding the image and a link but not offering a review. Father Tim’s prayers, sermons, and reflections are a beautiful part of the Mitford series. I have wept and prayed along with him on many occasions, as he has a knack for praying exactly what my heart longed to say. His reflections are deep, thoughtful, and insightful. Based on my experience with the Mitford books, this, too, is worth the read. This is a new book and scheduled to be released in October 2018. It’s available for pre-order. This collection of wisdom, humor, and guidance was released in 2006 but the truth it contains has in no way lessened over the years. I haven’t read this book. Yet. It’s definitely on my reading list. Published in 2006, this book contains essays by Jan Karon about her own life, writing, and Mitford. It’s a compendium of characters, favorite scenes, and some of Uncle Billy’s jokes. It might be worth it for the jokes alone. It doesn’t cover all the Mitford books, of course, but it does cover the first decade’s worth. It’s available for Kindle and print, both paperback and hardcover. Used copies are available, many in like-new condition. Whew! All the Mitford books with descriptions, images, and links. If you love Mitford, I hope you’ve found some new reads to try. If you’ve never read Mitford stories before, why wait? New friends await you on every page. It would be a huge help if you’d share to social media and pin to Pinterest! Here’s an image to pin on Pinterest!